To build your own sectional choose from 15 available pieces and build your own sectional! Available pieces include: Armless Sofa, Armless Loveseat, Armless Chair, LSF Section, RSF Section, LSF Loveseat, RSF Loveseat, RSF Chaise, LSF Chaise, LSF Piano Wedge, RSF Piano Wedge, Corner, Cocktail Ottoman 40", Cocktail Ottoman 51", and Storage Console Box with Cupholders. The Mammoth Collection by Jackson Furniture offers modular pieces that can be used to create multiple configurations, fitting perfectly in the desired space. This group presents Casual Contemporary Style with Eclectic Mix of Contemporary Pillows. The pieces are upholstered in Plush Textured Polyester Fabric available in two colors: chocolate and smoke. This collection also features Steel Tech Framing and Comfort Coil Seating with Comfor-Gel for countless hours of relaxation. 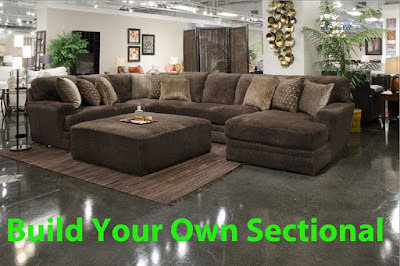 The BUILD YOUR OWN option allows you to choose the pieces you would like to include in your sectional. Please, measure the space in your room and select the right pieces. Sectional can be ended with: RSF or LSF Piano Wedge, RSF or LSF Loveseat, RSF or LSF Chaise, or RSF or LSF Section (3 seater sofa). In between the pieces, you might fit Armless Sofa, Armless Loveseat, Armless Chair, Corner and Storage Consoles. Please, check provided images for exemplary schematics. Matching Cocktail Ottomans are available as an option. To view the entire Mammoth Collection click here.